Florida Gov. Rick Scott has chosen Miami-Dade Property Appraiser Carlos Lopez-Cantera to fill the long-vacant post of lieutenant governor. Scott announced the appointment of Lopez-Cantera on Facebook, shortly before they appeared together at a news conference in Miami Tuesday morning. Scott said Lopez-Cantera's leadership and business experience helped him get chosen for the job. "He is focused on how we can transform our economy so we aren’t just creating jobs, we are creating careers and opportunities for this generation and for the next generation," Scott said. "I'm confident we took the right amount of time in finding the right person to be our next lieutenant governor." Lopez-Cantera, 40, was born in Madrid, Spain, but grew up in Miami. He is married and has two daughters. "I'm very excited to be a part of the governor's team and looking forward to getting involved in the action in Tallahassee," Lopez-Cantera said. He spent eight years in the House, rising to the position of House Majority Leader in 2010 before he was forced to leave in 2012 due to term limits. He was elected property appraiser in 2012 after working as a real-estate agent and serving on the Miami-Dade County planning advisory board. His appointment comes almost 10 months after former Lt. Gov. Jennifer Carroll abruptly resigned after she was interviewed by law-enforcement authorities about work she once did for a charity that prosecutors have said was a front for a widespread gambling ring. She has not been accused of any wrongdoing. Scott is filling the spot of lieutenant governor a week after he was sued by a Tallahassee lobbyist and political activist for leaving the position vacant since March. Barbara DeVane, who filed the suit with the Florida Supreme Court, contended Scott was breaking a state law that requires him to appoint a lieutenant governor. Florida went nearly 100 years without the post of lieutenant governor until it was revived in 1968. The job, which pays nearly $125,000, has no real defined responsibilities besides replacing the governor if he leaves office or dies. Shortly after Carroll resigned, Scott shuttered her office and fired the employees. The governor initially said he planned to wait until after the 2013 legislative session - which ended in early May - to look for a new lieutenant governor. He also said he planned to put his chief of staff, Adam Hollingsworth, in charge of the search. The selection of Lopez-Cantera could help Scott with Hispanic voters as well as voters in populous Miami-Dade County. His connections with the Legislature could also help Scott during the upcoming session. During his time in the Legislature, Lopez-Cantera disagree with Scott. When Scott criticized the level of education funding in the state budget in 2011, Lopez-Cantera called the governor's comments a "mischaracterization." The Miami Republican pointed out that legislators set aside more money for schools than Scott himself had recommended. The appointment was applauded by several political leaders across the state. "I know how important it is to choose a Lieutenant Governor who shares your vision for improving Florida and reforming government. Governor Scott's selection of Carlos Lopez-Cantera is a great pick for Floridians," former Florida governor Jeb Bush said. 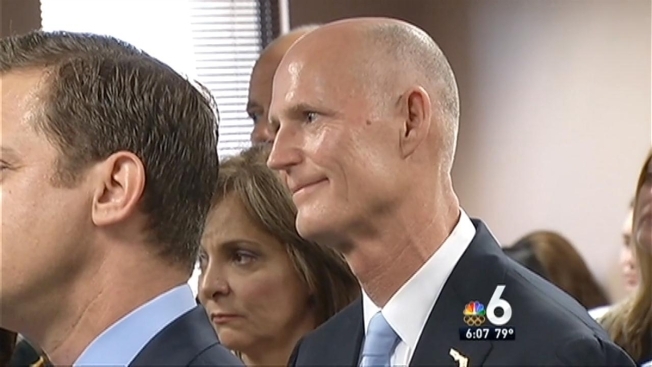 "I applaud Governor Scott on his choice and wish my friend Carlos the best of luck as he continues to serve the people of Florida in this exciting new position." "I have worked with Carlos Lopez-Cantera on many important issues and look forward to working to with him in his new role as Lieutenant Governor," Miami-Dade Mayor Carlos Gimenez said. "I appreciate Governor Scott appointing a candidate who has such a rich history of service to Florida and commitment to continually improving our state’s business climate."